Just the energy building nutrition your dog needs when he needs it. No added supplements, electrolytes, or dyes. Pricing now includes FREE SHIPPING in US via USPS Priority Mail. 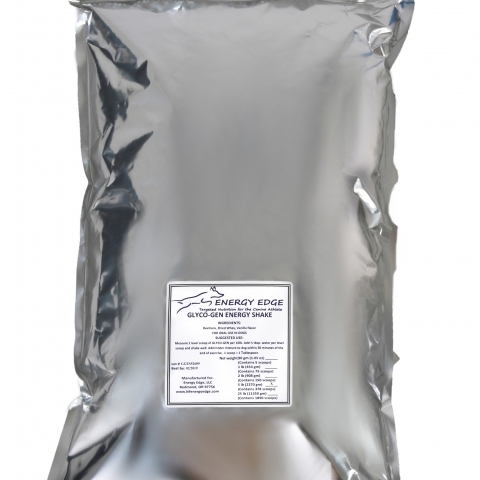 K9 Energy Edge Glyco-Gen Shake Mix is packed in a resealable mylar bag for our 1 and 5 pound options, or a refillable plastic screw top jar for our 2 pound option. It only take a little water and one tablespoon per 10 pounds of dog body weight to mix into a shake like consistency. Our combination of Maltodextrin, Whey Protein, and Vanilla flavor gives your dog just they energy building nutrition they need... when they need it. Packed in a resealable Mylar bag. Contains 75 scoops! Packed in a semi-rigid plastic jar with a twist on lid. 150 scoops! Perfect for travel! Can be reused and is refillable. Economy sized! Packed in a reseable Mylar bag. Contains 375 scoops! Great for refilling a 2lb jar. 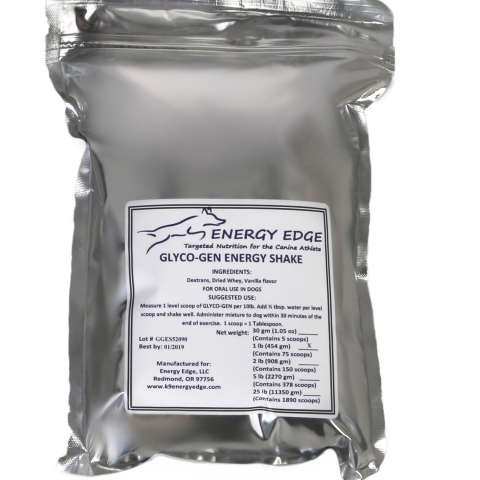 K9 Energy Edge Glyco-Gen Energy Bones include 14 grams of our Glyco-Gen Shake Mix, compressed into a waterless servings. 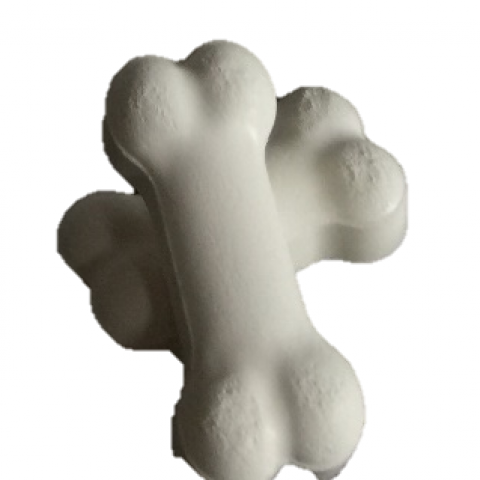 All it takes is one bone per 20-30 pounds of dog body weight. 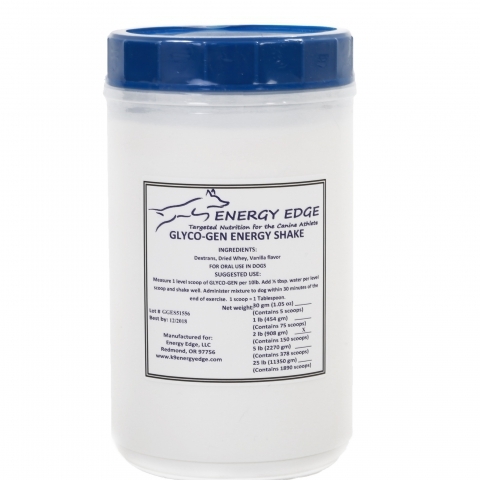 Target your canine athlete's energy needs quicker and easier than ever before. Our combination of Maltodextrin, Whey Protein, and Vanilla flavor gives your dog just they energy building nutrition they need... when they need it. *All K9 Energy Edge orders are shipped within 1-2 business days by USPS Priority Mail. At this time we are not shipping Express or Overnight. Customers outside the Continental U.S. Please email or call for shipping rates. It is our goal to provide the best customer service possible. If you have any questions, please email us at EnergyEdge@k9energyedge.com or call us directly at 503.680.2007. Thank you for your business!